If motivation is even slightly a problem, then a pre-workout energy drink is a great solution and gives you that needed boost. Bust most of these drinks are designed for men looking to pack on muscle. So what about women? We answered. Our energy drink brings superior ingredients, beta-alanine, natural amino acids like glycine and taurine, all backed up by the fat-burning powder of l-carnitine and Advantra Z. 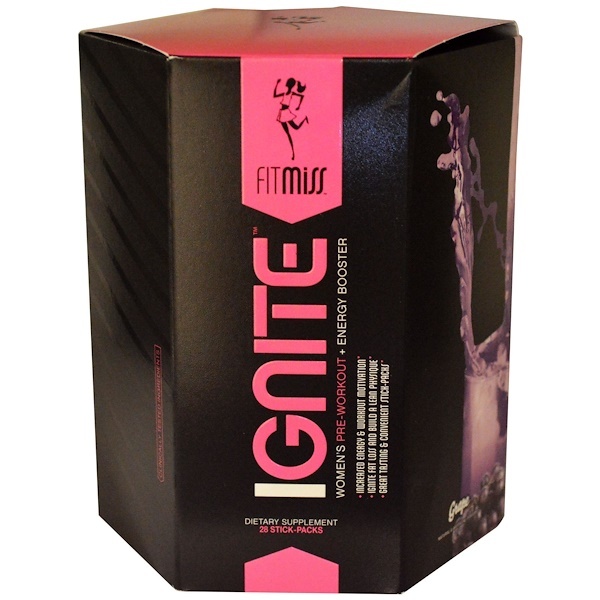 This is FitMiss Ignite. A thermogenic with muscle supporting function. It also energizes. Improves your workout & help build a lean physique. Malic acid, natural & artificial flavors, silicon dioxide, sucralose, acesulfame potassium, natural blue color (fruit juice concentrate, citric acid, gum arabic, tricalcium phosphate), salt. Allergen Warning: This product was produced in a facility that may also processes ingredients containing milk, egg, soybeans, shellfish, fish, tree nuts, wheat, and peanuts. Storage Conditions: Store ina cool dry place. Not intended for use by person under age 18. Do not exceed recommended dose. Do not consume synephrine or caffeine from other sources, including but not limited to, coffee, tea, soda and other dietary supplement or medication containing phenylephrine or caffeine. Contains caffeine. Do not use for more than 8 weeks. Consult with your physician prior to use if you are pregnant or nursing, or if you are taking medication, including but not limited to MAOI inhibitors, antidepressants, aspirin, nonsteroidal, anti-inflammatory drugs or products containing phylephrine, ephedrine, pseudoephedrine, or other stimulants. Consult your physician prior to use if you have a medical condition, including but not limited to heart, kidney, or thyroid disease, psychiatric or epileptic disorders, difficulty urinating, diabetes, high blood pressure, cardiac arrhythmia, recurrent headaches, enlarged prostate or glaucoma. Discontinue 2 weeks prior to surgery or if you experience rapid heart beat, dizziness, severe headache or shortness of breath.